Opposition members in Bangladesh have gone into hiding as police carry out sweeping raids after the country’s violent national election, a news report and a rights group said Thursday. The ruling party easily won Sunday’s election, which was marred by street fighting, low turnout and an opposition boycott, with at least 18 people dying in election-related violence. The vote only exacerbated tensions in this South Asian nation, which has a grim history of political unrest. Political violence has convulsed Bangladesh in recent months as opposition activists staged attacks, strikes and transportation blockades to protest Prime Minister Sheikh Hasina’s government. Nearly 300 people have been killed in the violence since last February. On Tuesday, detectives arrested four opposition leaders, including an adviser to opposition chief and former Prime Minister Khaleda Zia. All four are still in jail. Many other senior opposition leaders, including a former law minister, have been arrested in recent months on charges of fueling violence and also remain jailed. Police say they are investigating the charges, which the opposition says are politically motivated. Mirza Fakhrul Islam Alamgir, acting secretary-general of Zia’s main opposition Bangladesh Nationalist Party, or BNP, said this week that hundreds of party leaders and activists had gone into hiding because of harassment by authorities. New York-based Human Rights Watch said “many opposition leaders and activists have gone into hiding,” and accused Bangladesh of conducting arbitrary arrests of opposition members before and after the election. Mass arrests are common during political turmoil in Bangladesh, where power transfers are often bloody affairs. Since its independence from Pakistan in 1971, Bangladesh has seen two presidents assassinated and 19 failed coup attempts. Opposition activists typically take shelter in relatives’ homes or slip out of the country, pretending to be tourists or business travelers. Bangladesh’s newly elected lawmakers took the oath of office Thursday as Hasina moved forward with forming the new government. The opposition had demanded that Hasina’s government resign so a neutral administration could oversee the polls, saying Hasina might rig the election if she stayed in office. She denied that. 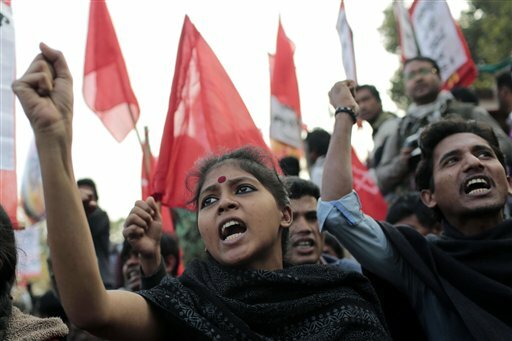 The political gridlock plunges Bangladesh deeper into turmoil and economic stagnation. The country also is struggling to reinvigorate its $20 billion garment industry, which has been hit by a series of horrifying disasters _ including a factory collapse last April that killed more than 1,100 workers.